Ed. note: It's going to be a relatively slow week on the site this week. I have family in town and this game was never in doubt. Chances are there will only be one post a day this week. Some might come later than usual. A lot has been made of Denard's regression in the passing game this year without many answers. His accuracy has always been a problem, but more disturbingly, Denard makes poor decisions, often throwing deep into double coverage. Jump balls have become a staple of the offense but they haven't been a particularly reliable option. One jump ball that Denard threw against San Diego State illustrates why his passing numbers may be so poor this season. It's midway through the first quarter and Michigan just forced the first of Ronnie Hillman's fumbles. The offense comes out in a shotgun, three-wide, two-back set. The defense is in a 3-4 front wth man coverage. On the snap, the defense rushes five with a stunt on the defensive line. Denard has man coverage on all the receivers with one "deep" safety (who is only six yards from the line of scrimmage). A moment later, Denard has locked onto Roy Roundtree on the outside. My impression is that the coaches told Denard to take shots down the field. He was likely told that whenever he has one-on-one man coverage on the outside without safety help, that he should throw it up to that receiver. Here, Roundtree has single coverage on a fly route. On the other side of the field, Drew Dileo and Junior Hemingway are bother going to run hitch routes; Denard will never see these. Hemingway and Dileo are breaking off their routes. The closest defender to either of them is five yards away. Roundtree, meanwhile, was jammed at the line of scrimmage and being pushed to the outside. Denard is about to throw to Roundtree who still hasn't beaten his defender. 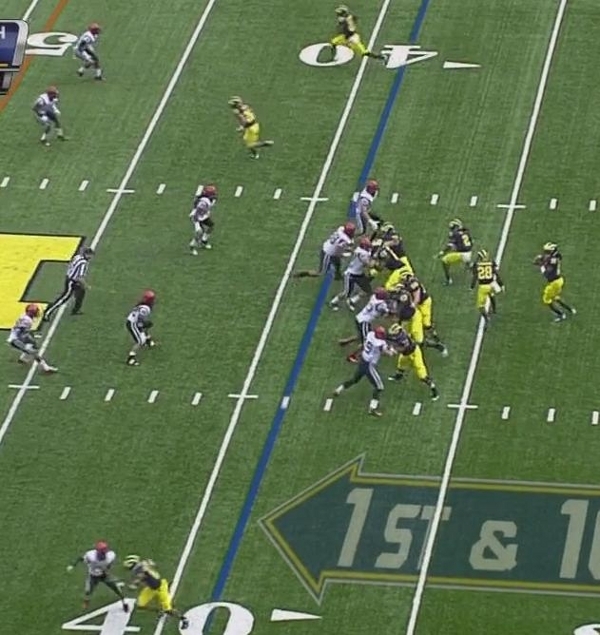 As Denard lets the ball go, Roundtree is still below his defender. In addition, SDSU's safety is breaking on the pass, though he's too far from Roundtree to be a factor. Dileo and Hemingway are wide open. 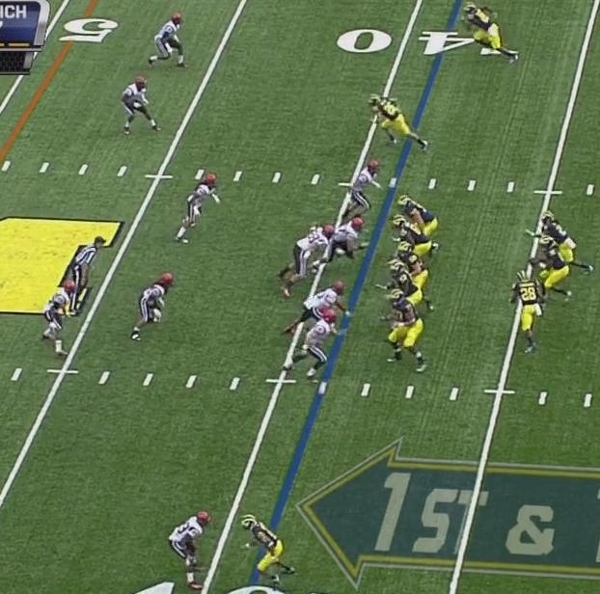 This is a fundamental difference between Al Borges' and Rich Rodriguez's offense. In Rodriguez's option offense, the focus was always to pick up yards and stay ahead of the down and distance. Any time they did take a shot downfield, it was the QB Oh Noes that were wide open. In this pro style offense, the coaching staff expects Michigan's players to simply out perform the defense, rather than keeping them guessing with simple routes and reads that would produce 5-6 yard gains and possible yards after catch*. There's nothing wrong with this style of offense if you have the players to do it (the Chad Hennes and Braylon Edwards of the world). Michigan. however, is loaded with players that aren't necessarily able to out perform their counterparts, rather, they're able to make something out of nothing. Denard needs to recognize the cushion that the weakside defenders are giving Dileo and Hemingway and pass on the single coverage against Roundtree, who isn't much of a leaper. I'd have to go back and look at the other ill-advised jump balls that Denard has thrown this season, but this seems like it's probably indicative of the problem: Denard making up his mind before the ball is snapped and throwing even when his receiver can't get free. It'll be crucial for Denard to be more judicious in these situations if the team is going to sustain drives and if Denard is going to keep his numbers up. *It would be difficult to track, but I would bet that a significantly higher percentage of Denard's passing yards last year came after the catch. This season, when he completes passes, they seem to be further downfield. This probably also explains his lower completion percentage. Great writing. Not going through his options has always been a problem for Denard. 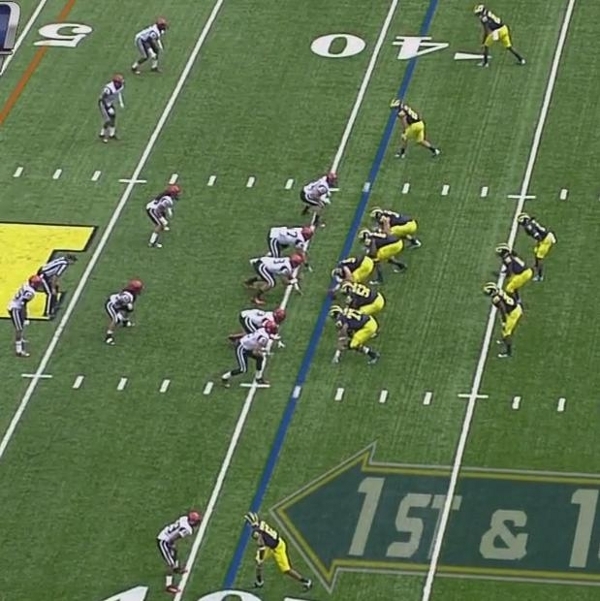 There are a lot of cases he throws into double coverage with another guy(s) wide open. Don't you contradict yourself here? "My impression is that the coaches told Denard to take shots down the field. He was likely told that whenever he has one-on-one man coverage on the outside without safety help, that he should throw it up to that receiver." On the other hand, you criticize Denard for following that advice, and throwing to the single-covered outside receiver. If your supposition about the play design is correct, Denard identified the coverage and made the right read. Your beef should be with Borges (and is in a subsequent paragraph), but this isn't a place that Denard deserves criticism. It's a play that he read correctly (or at least if we grant your guess as to what Denard's supposed to read), but just didn't work. Regardless of the freedom that the coaching staff gave to Denard, he still needs to recognize when he has favorable matchups elsewhere and when he should take a shot downfield. He's making up his mind too early and as such, forcing the ball into areas that he shouldn't. I think he saw a favorable matchup on his primary read and made the right choice. This is an unfavorable matchup if there's a safety over the top or if the CB is bailing out into a deep zone. Those would examples of forcing the ball where he shouldn't. 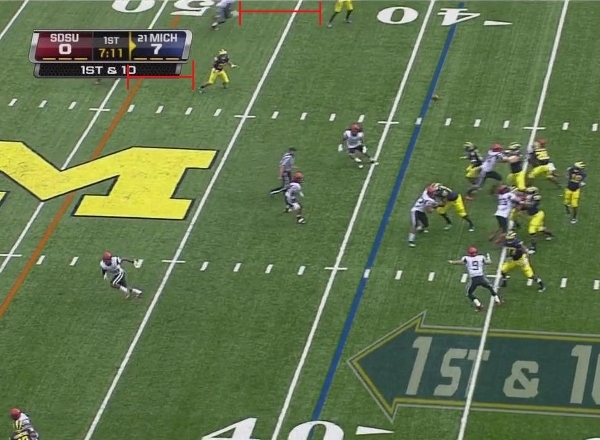 Here, Roundtree has gotten a release, and the CB has turned his back and is chasing when Denard throws the ball. That's what you want to see on that route. It's high reward, low risk, since RR can see the ball and the CB can't. Now, maybe Roundtree's not the guy you want running the go route on the outside (neither fast enough to get separation, nor particularly good at high pointing the ball) but that's a personnel issue, not QB decision issue. If the primary receiver seems to be in the process of beating his man in single coverage, that's where you go with the ball. Don't get me wrong, Denard definitely forced the ball during this game and didn't come off of his primary target on other plays. I just don't think this is the best example of this issue. (the Koger deflection/interception is). BTW, love the blog and your breakdowns. I just think you're wrong about this play (though your meta point about the offense relying on playmakers rather than scheme is compelling). I agree that this isn't TOTALLY on Denard but at the same time, Borges is not instructing him to go for his primary read regardless of coverage. On the last image, the ball is at the LOS (therefore thrown a split second before) and Roundtree is trailing his corner. Even without safety help, this is a bad decision, especially when you see what's on the other side. But to me, this is a bad decision for Andrew Luck, not Denard. I think what goes through his head pre-snap is 90% made up. If he sees immediate safety help on his primary read, he'll pull it down and run. 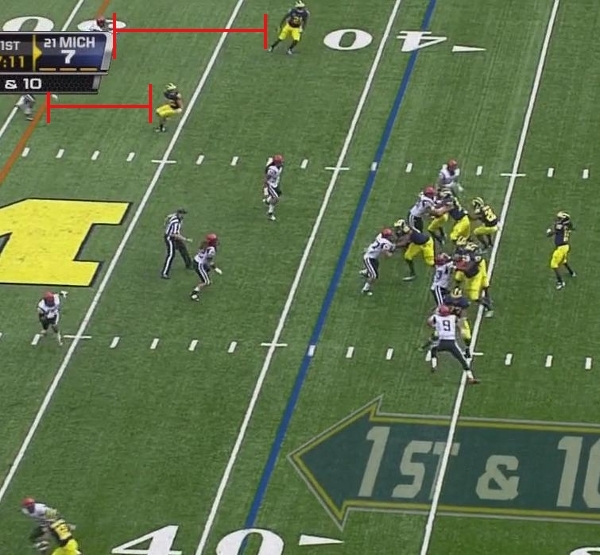 But at this point, I think Denard is willing to take 1-on-1 coverage with Roundtree. Right now, at Denard's passing level and ability to read coverages, this is a decent decision within a bad one, if that makes any sense at all. The larger issue, as Chris correctly points out, is where does Borges go from here. This is not Brady/Moss, Henne/Braylon. Even if Borges sticks with this, I doubt Denard will pick it up by seasons end, if at all. At some point, Borges will have to consider RichRod's passing playbook too if the numbers continue to plummet.